By Chris Williams: WBO super bantamweight champion Nonito Donaire (30-1, 19 KO’s) badly wants to face WBC super bantamweight champion Abner Mares (25-0-1, 13 KO’s) after Donaire makes short work of veteran Jorge Arce (61-6-2, 46 KO’s) on December 15th at the Toyota Center, in Houston, Texas, USA. 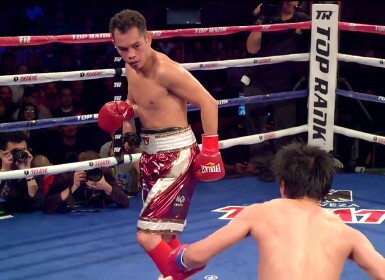 Donaire is hoping his promoter Bob Arum of Top Rank will make the Mares fight next. However, there are many things working against the Donaire-Mares fight from taking place anytime soon, as Mares fights for Golden Boy Promotions, while Donaire fights for Top Rank. That kills the fight right there. Additionally, Mares fights for Showtime, and Donaire for HBO. That pretty much removes any chance of a fight between them. The opponent that Donaire will likely face after the Arce slaughter is WBA World super bantamweight champion Guillermo Rigondeaux (11-0, 8 KO’s), who fights for the same Top Rank stable. Arum has put Rigondeaux on the undercard of Donaire’s fight with Arce on December 15th, so it’s pretty clear that Rigondeaux is the guy that Arum will be looking to put Donaire in with next after Arce. Rigondeaux is fighting Poonsawat Kratingdaenggym (48-2, 33 KO’s) in a fight that should tell boxing fans about how good Rigondeaux is. He shockingly struggled in his last fight against 22-year-old fringe contender Robert Marroquin last September in a fight where Rigondeaux was stunned several times in the fight. Rigondeaux won the fight by a 12 round unanimous decision by wide scores, but it was a really bad sign to see Rigondeaux getting hurt over and over again by a fighter like Marroquin, who likely will never be a world title holder. It’s true that Rigondeaux isn’t anywhere near as popular as Mares is, so it’s hard to blame Donaire for not being excited about facing him. However, that doesn’t mean that Rigondeaux isn’t dangerous and can’t possibly beat Donaire. If you remember the Joe Frazier vs. George Foreman fight in 1973. Frazier was incredibly popular going into that fight, while Foreman didn’t have a huge fan base. It didn’t matter because Foreman destroyed Frazier in two rounds. Donaire shouldn’t be dismissing fighters before he’s ever faced them, because he’s not shinned in many of his fights recently. Donaire did a great job in his last fight against Toshiaki Nishioka, but the guy was 36 and not nearly as good as Donaire claimed he was. Donaire said Nishioka was the best fighter in the super bantamweight division, yet Nishioka’s poor performance against Rafael Marquez a year earlier told a different story. Donaire looked terrible against the young Jeffrey Matthebula and Wilfredo Vazquez Jr. Donaire may struggle against Rigondeaux and he could end up getting out-boxed or stopped with a body shot by the Cuban. Rigondeaux can actually fight and he’s not a shot fighter. Donaire needs to stop thinking about Mares and focus more on Rigondeaux, because that’s who Arum is likely to put him in with next after Arce.